A few weeks ago I discovered just how easy it is to make hummus. Not only is it easy, but homemade hummus tastes far better than store bought. While I thought my last hummus was good, this one surpasses its predecessor by leaps and bounds! The addition of lemon juice and a touch of soy sauce give this dip a savory edge that is irresistible. Garbanzo beans whirred in the food processor provide a high fiber, cholesterol lowering punch, with the addition of heart healthy olive oil only increasing the goodness of this savory snack. Add a side of broccoli, carrots or zucchini and you have a snack you can feel good about. In a small saucepan, combine the 2 Tbs olive oil with the garlic and cumin. Set over medium-low heat and cook until the garlic softens. About a minute after the garlic begins to bubble remove the pan from the heat and cool completely. Place the garbanzo beans, tahini, lemon juice, soy sauce and salt in a food processor. Use a fork to remove the softened garlic from the oil and drop into the processor. Process for about 30 seconds, then slowly pour the garlic/cumin oil through the machine's feed tube. With the machine still processing, pour 2-3 Tbs of cool water down the tube, stopping to scrape down the sides of the bowl. Continue processing until the hummus is creamy and smooth. Season to taste with additional salt or lemon juice if desired. For best results allow the hummus to sit at room temperature for an hour or two to allow the flavors to meld. To serve, spoon the hummus into a serving bowl and drizzle with additional olive oil (I used a lovely garlic oil!) and chopped red onion. Serve with veggies, pitas or pita chips. Love your hummus. To me it's not a hummus if tahini is not added. You have a perfect addition of that, plus cumin, soy sauce, garlic, and red onion...all these ingredients are my very favorite. Will try this, for sure!...Pretty photo too! I've never made hummus before, but yours sounds so good. I might have to lower the sodium a bit, but I'm sure that it will still be delicious. Your pictures are gorgeous! This looks great, I'll have to try it. By the way, I just made your melting moment cookies last night. They were fab. Very sweet, not quite my thing in that respect, but they came out wonderfully. Thanks! Now that I've made white bean dip at home, I think I'm ready to give hummus a go...this looks so GOOD! I've never made my own hummus before, but that sounds delish! Love the pics!! haven't tried home-made hummus before but you make it sound so simple :) it looks delicious too! Isn't homemade hummus amazing! It is so much cheaper and it tastes so much better...plus you can add all sorts of different ingredients in to keep it exciting. Thank you for sharing; your pictures are stunning, as always. And thank you for your kind words on my blog...they mean a lot to me during this trying time. This looks really good. I am going to have to try making some now that you have shown me how easy it is. I love your photo too. Nothing can be compared to homemade. In the case of hummus is even stronger. All these ingredients used, if they are fresh, they completely elevate the taste of it. I like how you have seasoned the Hummus. Delicious. Wow! I never thought to add soy sauce! Love hummus and this sounds delicious. And can I tell you that your photo with the candlelight and bottle of wine just made me wish I was sitting right there with you enjoying! I *love* making hummus. I have not had store bought since I learned to make my own. I really love making it and because I make enough for most of the week, I end up making hummus gyros one of the days and O-M-G is it so good. Especially over falafel! Or a mayo substitute in a sandwich! I like the addition of soy sauce, I'll have to give that a try! Thanks! I'm a huge hummus fan, looks great! Bravo and welcome to the hummus world! It's a staple in our house. I grew up with it and so my daughter will too. 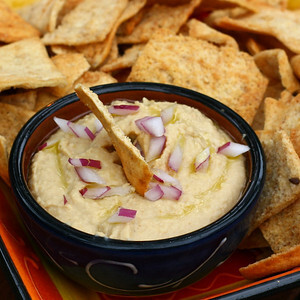 I smiled at this: "homemade hummus tastes far better than store bought." Amen, sister! Our family has always used lemon when making hummus, but not cumin (which would take away it from the Middle East region). Your dish looks wonderful. hands down, really good hummus! Not only is this easy but a huge crowd pleaser. It tastes so much better than store bought when you make it yourself! I just made this with some black olives in it. It is going to be a hit at the pumpkin carving party we are going to tonight! 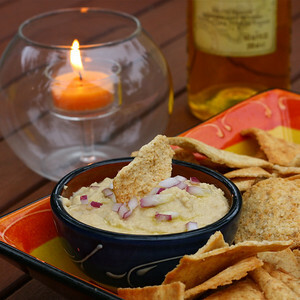 "Hummus a very popular Middle Eastern dip that is used as an appetizer and served with pita bread." this is perfect for halloween.